Fresh Start strives to create an equitable and supportive environment for its staff through employment opportunities, increased health benefits from gainful employment, as well as offers a strong sense of community for staff to belong to. While expertise, professionalism, and client satisfaction are key standards of the company; a strong social component offers staff the chance to combine business with pleasure. Fresh Start’s consumer/survivor employees are proud Canadians coming from a wide variety of backgrounds with unique perspectives and histories eager to earn some money to help pay bills, increase purchasing power, develop friendships, and to do something meaningful for themselves and their community. Fresh Start’s workplace flexibility accommodates scheduled appointments and sick days without the fear of dismissal or reprimands. Fresh Start strives to carry out all the work it performs in a professional manner to the ultimate satisfaction of the customer. Client or member centered Consumer/Survivor Initiatives (CSI’s) such as Fresh Start facilitates and empowers a smooth transition back into the community for people suffering or who have suffered from a debilitating psychiatric illness. CSI’s play a significant yet undervalued role within Ontario’s Mental Health System as shown in evidence based studies where large reductions in the utilization of crisis centre’s, hospitals, and other expensive services occur when consumer/survivors use or become employed with these services. The cornerstone of CSI’s is the peer support approach they offer. On a regular basis Fresh Start’s employees support one another in navigating community and income supports, healthcare, housing and at times legal issues. Building a sense of belonging and creating a community has been a distinct and positive feature of the business. Together the board, administrative staff, and member employees engage in an on-going struggle to balance the “community” and the “economic” aspects of Fresh Start as a community economic initiative and continue this struggle to balance each with great pride. Fresh Start serves the greater Metropolitan Toronto area. These services include office, commercial, apartment building, and residential janitorial cleaning as well as lawn care and snow removal. Fresh Start’s funding partners include the Toronto Central Local Health Integration Network (TCLHIN) providing support in the form of an annual grant which covers the majority of the office’s administrative and operating related costs and from the City of Toronto who directly funds Fresh Start’s Extreme Cleaning Program; a service offering residents of Metropolitan Toronto “West of Yonge Street” cleaning, bedbug spraying preparation and de-hoarding services for those who face imminent eviction from their household based on the lack of cleanliness or fire risk present in their homes because of inaction. As a direct positive consequence of successfully providing the City of Toronto extreme cleaning services for over ten years, Fresh Start has expanded its general services to include de-hoarding and bedbug spraying preparation throughout the greater Metropolitan Toronto area. Although grants are much appreciated in supporting office staff endeavors the commercial revenue Fresh Start generates directly from clients and customers covers all expenses related to the actual field work primarily salaries and benefits, and also covers substantial costs for supplies, equipment, transportation, insurance, storage, as well as covering many other business expenses some of which are office related. The direct result of Fresh Start’s rapid expansion was that commercial operating costs soon exceeded the capacity of its generous government supports to offset many of these expenses. Thus costs of doing business were more pronounced and services had to represent these additional expenditures in a new price structure. Signs of Fresh Start’s rapid expansion were the addition of new office positions including a Payroll Clerk, Human Resources and Customer Relations Coordinators to deal with a three to four times increase in actual workloads of existing staff that followed rapid success. The in-office expansion was at the expense of direct supervision in the field where the majority of Fresh Start’s Supervisors would now have to be paid through revenue generation not government grants. Fresh Start has been very successful with this transition over the past ten years due to low rental office costs, prudent spending, and an increase in client business. In 2011 upon receiving word that 761 Queen Street West was being sold finding alternate office space became a top priority for Fresh Start after an unsuccessful bid at purchasing 761 Queen Street West. Thereafter, the Executive Director and Board of Directors strategically developed a strategic relocation plan with the ongoing input from its membership to offset the high cost of rental properties in Toronto by directly purchasing a property that would serve the Corporation’s central location requirements for the foreseeable future. 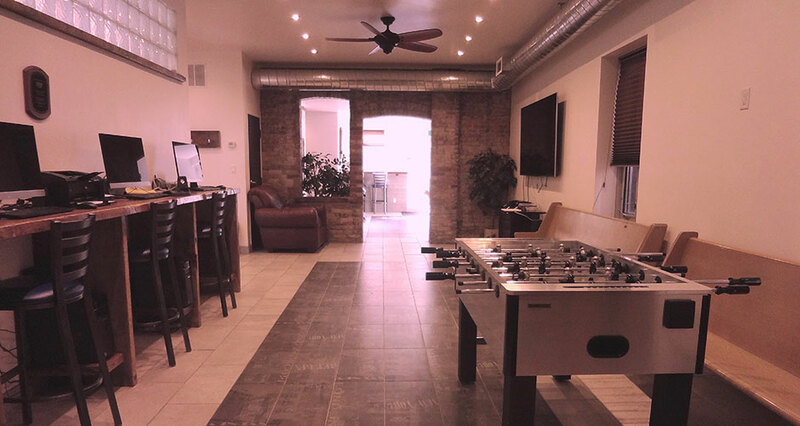 In late 2014 after intensive renovations Fresh Start opened its doors at 3345 Dundas Street West; a prime setting in close proximity to the community it serves complete with office and recreational space capable of embracing the company’s business and social components. Fresh Start’s decision to purchase this property is proving to be a positive investment in its future and a real legacy to hand to future members of the Corporation.